The seasoned star, Peyton Manning, in what could be his final game, versus the new star, Cam Newton. The only improvement from my New England perspective would be watching our Patriots this Sunday, but I am sure I will enjoy the excitment on the field and off, with the TV commercials and halftime show. Beyond the entertainment of the Super Bowl, the NFL runs a business that generates exceptional returns. If marketing is your game, you could do a lot worse than to follow the lead of the NFL. In investing, we can also learn a lot from some NFL stars. Star players run up impressive records on the field, but many stories exist of even combined Heisman Trophy, College National Champion and Super Bowl stars like Tony Dorsett failing in finance (Cam, if you win Sunday, read here and don’t let this be you). Some might think spending is the problem, and in some cases you would be correct. More often than not, however, professional athletes make the same mistakes as many other investors. I won’t make any comments on family issues, and I am not an accountant, but I will make a few quick comments on investing. In our last post, Groundhog Day, I talked about the halo effect, which is a documented psychological bias we have to place confidence in people who are better known and deemed to be more intelligent, better looking, or more respected. What marketing machine knows this well? Evidence consistenly shows that low cost, boring, simple investments such as index funds often outperform more complex strategies, but our defenses are constantly rushed with CNBC spots presented by professionals with halos. In the morning someone might say “buy”, but in the afternoon someone might say “sell”. 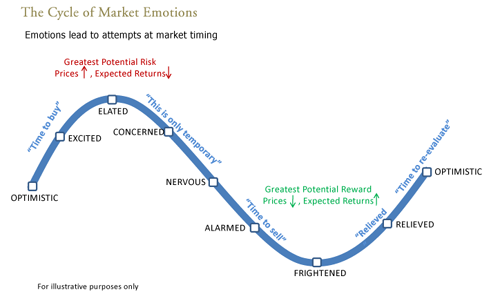 It is no wonder studies show that the average investor significantly underperforms the market due to emotional selling or buying at the wrong time. According to research from Morningstar, the 10-year return of the average balanced fund (mix of stocks and bonds) for the period ending 12/31/13 was almost 7%. What was the average return of investors in balanced funds over this same time period? Approximately 5%, which represents a gap of 2% on average per year for 10 years. The gap for investors in sector funds, which tend to attract more active traders, was even higher at over 3% on average per year for 10 years (click here for the full report and see the below chart). So, why so much focus on new investing plays? Just as exciting calls on the field drive sales of TV ads and profits for the NFL, transactions and new products quarterbacked by haloed investment managers drive Wall Street profits. As I wrote about in Your Brain On The Market, if an investment coach is constantly recommending new schemes, especially during volatile times, “Just Say No”. Next, as your own best general manager, consider firing the coach. I heard this one night over dinner from the Global Chief Investment Officer of a large international wealth management firm. I got to know this person well over the years and even though it was his job to help pitch active investment strategies, ironically he often said his belief in investing skill was very low. What did he quietly admit was often the best choice for investors? Crazy you might say. Top investors don’t invest passively. They are active stars who have access to the best talent and top MBA draft picks. With their years of training and resources, surely they believe they can consistently post record stats. What have a few investing superstars said on the record? First, consider David Swenson, Chief Investment Officer of Yale’s Endowment. Yale and other Ivy League schools might not produce as many NFL stars as my favorite SEC schools, but they do have some of the top endowment returns in the nation, and Yale consistently leads the division. What does Swenson say in his book on personal investing? You can read more on this in a piece that I wrote titled What Would Yale Do If It Was Taxable (yes, as Swenson and the NFL agent mention, don’t forget to factor in taxes). Second, how about Warren Buffett? Recently, he gave the following advice on CNBC to the NBA star, LeBron James. So, before rushing onto the investing field, consider taking a time-out. Don’t get by getting caught up in Super Bowl type investing hype, and don’t make investing a competition. Is winning really defined by outperforming the other guy or is it about reaching goals on behalf of your family? To avoid getting sacked by Wall Street’s marketing blitzes, stick to your long-term game plan and consider following the advice of investing superstars such as Buffet and Swenson. As they have said, the evidence is clear on how to consistenly produce goal winning investment scores. Keep it simple and consider more index funds. The picture in this post is from an album cover that was reportedly prepared for the band, The Talking Heads. The theme of the blog is based on their album, Speaking In Tongues, and its hit single Burning Down The House (for an 80s throw back moment consider clicking on the previous link). I will avoid pointing out the well known investment professional who is reported to have made this quote, but as I just wrote in my last blog titled Your Brain On The Market, headlines like this from Wall Street talking heads don’t help investors make constructive decisions. Often, they only create unneeded emotion and fuel irrational behavior that harms long-term returns. 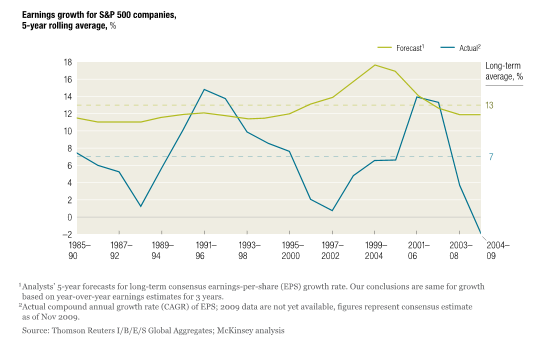 As we have written about many times before, at the very least prognostications like this tend to be inaccurate (consider clicking on the following If We Had A Chief Economist We Would Have To Pay Them). At worst, they are self serving. When I was a Managing Director at a large asset management firm, I sat in on media training with our senior portfolio managers. What was the most important message PMs were told to reinforce in interviews? Potentially along the lines of today’s “Delusional” comment, PMs were also told to talk down positions that they did not hold, which were part of their index or were large holdings of their competitors. I actually witnessed portfolio management teams watch CNBC interviews and then cheer as they saw large numbers of buy or sell trades come across the ticker based on their colleague’s comments. I could go on and on about this, but reaching back again to our last post, don’t let your brain get flamed up by stock market commentators or marketing presentations. Remember, market flames fueled by sensational quotes and headlines can burn down your investment portfolio. The title of this blog is taken from the “This Is Your Brain On Drugs” (see Brain On Drugs below) public service announcement (PSA) that was run by the Partnership for a Drug-Free America in the 1980s. Why is a wealth management firm talking about brains getting fried like eggs? It’s to remind everyone that powerful stimulants can impact our investment behavior. Drugs are stimulants, for sure, but so is money, especially when money is the focus of emotional media and unsettling headlines (see examples below). Last week, WealthManagement.com published a story discussing just how powerful a stimulant money can be. The daily brief gave an overview of a book out by Kabir Sehgal, Coined. Yes, your brain gets fried on drugs and it also gets fried on money. Many studies have shown that investors are more stimulated and feel more pain when they experience losses than when they experience gains. Even without the research, however, I think we know instinctively that we can get anchored on our failures instead of our successes or all the things we have to be thankful for. Coming back around to the stock market, we have certainly experienced a few emotionally-charged down days year-to-date. Why don’t we see more articles illustrating how markets tend to have solid rebounds off 10 day downturns, which reward long-term, patient investors? I will not mention the well-respected daily financial paper that published the headline above, but will remind you all that a bear market is a 20% drop, not a 10% drop. Being down 10% certainly gets our neurons firing. I encourage everyone to remember, however, that 10% drops are not uncommon. Think about the old saying, “Investors create 50 year floods every 5 years” (yes, it’s OK to smile when you think about the words “investors create”). If and when these predictions come to pass, to paraphrase another drug-related PSA, “Just Say No”. Finally, below is a chart that I hope will help us all feel better about the emotions we’re feeling (professional investors included). We aren’t sure what the next few weeks or months will bring, but “alarmed” and “frightened” comments (see the above graph) from seasoned investors can mean it’s a time to stay away from the market frying pan and make sure you don’t get fried by selling at the wrong time. To read more about advice we are giving to our clients, please read the following republished posts. They include research on how investors tend to underperform the market over the long term by making short term buy or sell decisions at the wrong time, along with a few rules for investing that we hope you will find helpful. We also discuss how Wall Street, and even Federal Reserve, prognostications and estimates are never in doubt but often wrong, but will save more on this for another post, which might also make for a good PSA. What Do Clients Really Value The Most? This client’s clear-eyed view of what was most important to him has stayed with me throughout the process of growing the firm. When my new partner and I were rebranding the firm Fiduciary Wealth Partners in early 2015, he and I decided to focus our approach on providing clients greater peace of mind by offering keep-it-simple investment solutions with full transparency. Fast forward to today and we are pleased to announce that we have been granted a registered trademark by the U.S. Patent and Trademark Office for Transparency, Simplicity, Peace of Mind ®. As I have written about in a number of articles (some listed below), this idea has become central to our philosophy. Related to simplicity, our investment process is focused on the consistent evidence that keep-it-simple index investment strategies often win. Index funds are not for everyone and we understand the argument for active management well (I spent over 20 years successfully selling active funds rising to the level of a Managing Director of a large asset management firm). Beyond the merits of index versus active investments, however, we believe the wealth management business spends too much time and money promising relative outperformance. Considering how hard it is to deliver on these promises and the enormity of the resources (firm time and client fees) spent in pursuit of something that research indicates is very elusive, shouldn’t we be focusing more on other things? Versus trying so hard to find and sell alpha, maybe the industry should be spending more time trying to understand clients’ feelings about risk and reward (not just presenting output from questionnaires or Monte Carlo simulations). Maybe we should offer full transparency (openly discussing both sides of a trade, fully disclosing all fees and terms, potential biases and conflicts). How about just communicating using simple language so clients can genuinely understand their investments? If so, maybe their greater understanding will help clients resist the urge to change course during short-term market corrections and instead stick to their long-term wealth plans. Investing should not be a competition, it should be a tool that enables an investor’s achievement of specific, personal goals. Let’s spend less time selling and sparring over relative performance and more time candidly discussing the pros and cons of issues important to our clients and their families. How about listening not just to respond but to understand what clients want to achieve? How about explaining what we can reasonably offer and, together with our clients, implementing strategies that increase comfort and peace of mind? As investment advisors, how do we add the most value for our clients? At Fiduciary Wealth Partners (FWP), this is a question we often ask ourselves. If you’ve read some of our other pieces, you know we are big fans of index investing as compared to active management. Some active managers have added value on a relative basis as compared to their appropriate indices, but at FWP we believe the evidence consistently points to the advantages of index funds (see our Say It Ain’t So, Joe commentary on active funds versus index strategies). When we talk about how to add the maximum value for our clients, however, I don’t think how we are performing relative to an index is the most important question. A recent article on the views of Seth Klarman, who is one of the most well-respected active investors of our time, got me thinking more about this question. Below is a link to the piece, which gives a good overview of Klarman’s philosophy. The investment business tends to attract competitive people who like to win, but in striving to be at the top of our peer group, I think the industry is too focused on relative returns. As Seth suggests, the quest to beat the market and earn a top ranking as compared to our peers can increase the assets that we manage and make us a lot of money. In doing this, though, do we lose sight of what is most important to our clients? If you really listen to what clients say, they consistently want goal-oriented advice that simplifies their lives and offers peace of mind about the financial future. The industry, however, continues to focus on the importance of having five star-ratings, spending an enormous share of its time and money promising, and selling the ability to pick a manager or strategy that can outperform an index (i.e., relative performance). Considering how hard it is to deliver on these promises, and how many resources (firm time and client fees) are spent in pursuit of something that research indicates is very elusive, I believe we should be focusing more on other things. Versus trying so hard to find and sell alpha, maybe the industry should be spending more time trying to understanding clients’ feelings about risk and reward (not presenting output from questionnaires or Monte Carlo simulations), giving full transparency (openly discussing both sides of a trade, fully disclosing all terms, potential biases and conflicts) and, importantly, making investors comfortable with their investments, so they have a greater likelihood of sticking to their plans. I believe that if more advisors used index funds, it could reduce what I think are relatively unproductive competitions to find and sell alpha. This said, humans are inherently competitive, and index funds are not for everyone (some people want to pursue the “New New Thing”). As I recently wrote in What’s In A Name, if investing in an active strategy or working with a large brand makes an investor feel more comfortable, and will allow him or her to stick to a plan more easily then, regardless of the relative performance versus an index, these might be the correct choices. Bottom line, I think the aggressive pursuit of alpha at the potential expense of greater absolute, goal oriented results should be more openly discussed. Rather than simply selling relative performance and relative risk metrics (Sharpe ratio comparisons, etc. ), let’s spend more time openly discussing both sides of topics, such as active vs. index funds, listening to what clients want to achieve, and implementing strategies that increase comfort and peace of mind. If we spent more time offering Transparency, Simplicity and Peace of Mind ®, I think it would increase trust in our industry as a whole and help us form more lasting partnerships with clients. Studies consistently back up this idea, finding that clients don’t change advisors based on performance, they change advisors based on concern that their current advisor doesn’t listen, understand and deliver what they want. Let’s remain mindful that investing should not be a competition with others, but the means to reaching client-specific goals. If we focus on adding true, long-term, goal-oriented value in a fully transparent manner, we may come in for short-term criticism, but in the end I think we’ll do the most good. By Learning Something From Juliet and Shakespeare? The title of this blog is from the following line from Shakespeare’s Romeo and Juliet. In this line, Juliet’s lamenting the fact that her family has deemed Romeo as inappropriate based solely on the Montague name or brand. Even though Juliet has just met Romeo at this point, she is looking beyond the brand and making decisions based on her own independent valuations, not the madness of the crowds (in this case the large family feud). My merchandise makes me not sad. Maybe in Romeo and Juliet he is telling us to not follow the emotions of the crowd or make decisions based on a brand or the perception of value. Over the years, I have seen many investors make decisions based on the emotional power of brands. Top Wall Street houses understand this well and often employ well-healed and articulate professionals to deliver emotional pitches, prognostications and presentations. As we have written in some previous posts, such as Pavlov’s Brokers, If We Had a Chief Economist We Would Have to Pay Them or Say It Ain’t So, Joe (the names give some of the punch lines away), incentives can drive firms to sell predictions and products that sometimes do not add much value, especially after fees and taxes. Why do so many investors, large and small, consistently buy branded products that don’t add much value? I could write a lot about psychological studies such as those discussed in behavioral finance but to keep it simple, I think it often comes down to a lack of information or in one word, transparency. A few recent stories related to transparency prompted me to write this literary themed piece. Over the past few months a lot of heated debate has been in the financial press about proposed fiduciary standard rules from the Department of Labor (DOL). The industry is largely up in arms about the DOL wanting to hold Wall Street firms to a higher standard of care, which would make them be more transparent and go to greater lengths to make sure that they were putting clients’ best interests first. A recent Barron’s article highlights the current rarity of investment fee transparency. In a pieced titled Overpaying For Financial Advice, Robert Milburn highlights information from a recent Morgan Stanley (MS) regulatory filing. It shines a bright light on what brokerage firms pay for investment products versus the fees that are charged to clients. Maybe more profit than you realize, or would be comfortable with, when you look beyond the brand. According to the Barron’s article, some MS clients are paying as much as 2.5% for active equity managers that only cost 0.42% (yes, a 6 X mark-up of the manager before resale). For elite, bespoke and separately-managed fixed income portfolios (sounds good and valuable doesn’t it? ), MS is only paying the “elite managers” 0.23% for what is sold to clients at 2.5% (a mark-up of over 10 times). At many brokerage and wealth management firms HNW and UHNW investors are sold what are often presented as boutique, alpha-generating separate account managers. Pitches often suggest that investors need to pay-up for valuable managers. What the Barron’s article lays bare is that the vast majority of the fee can be going to the broker-dealer, not the “valuable alpha manager” (over 90% in some cases for fixed income strategies, as disclosed in the Barron’s article). Investors think they are paying high fees for the manager. In reality, however, they are paying high fees for the broker-dealer business platform, marketing, sales management and commissions to brokers. Is it suitable to sell a client a product at a fee that includes a mark-up of as much as 10 times? The regulatory answer is “yes”. But while high mark-ups may be deemed by firms to be suitable, is it appropriate to sell clients on the idea that they are paying for one thing (alpha generating investment managers) when they are in fact paying the majority of the fee for something else (branding, marketing, sales and commissions)? This is a bigger question and would require a much longer blog. I think it is very safe to say, however, that clients are due greater transparency in what they are actually paying for than they have currently. So, how does this all leave us back at Juliet? Don’t be star-crossed and fall in love with a brand when entering into what can be an emotional relationship (money matters can be highly charged). Some find comfort in established brands and nothing is wrong with businesses having solid profit margins, especially if value is being provided. All we’re suggesting is that, like Juliet, investors should avoid making decisions on brand alone. Maybe someday regulations similar to the fiduciary rules being proposed by the DOL will come to pass and raise the bar for disclosures and increased transparency. In the meantime, ask more questions about fees, business models, profit margins and incentives. If more investors demand transparency then, regardless of regulations, change will come. What is in a name? In the investment industry, maybe more fees and mark-ups than you think. I hope this finds everyone doing well and, importantly, avoiding the day-to-day in the financial press. First, remember that the financial media thrives by writing colorful headlines, which draw eyeballs and hence sells advertising. China’s stock market – after one of the biggest run-ups in history – has dropped approximately 40% in just a few weeks. Greece is still in the news with the talk of new elections, and oil and other commodities are also down sharply. What should an investor do? Over the years, I’ve written many commentary pieces after market falls (it seems that concerns over 50 year floods come every 5 years or so in the stock market) and my message is always the same. I know it is hard to avoid getting emotionally drawn in by market headlines but try to remember that investing should be a means to an end, not a competition. Try to stay anchored on your plan versus getting caught up in the day-to-day. This is very difficult, by the way, and many investors make poor decisions at the wrong time. Earlier this year, Morningstar published a report that looked at the difference between the average return of mutual funds and the actual returns of investors. According to their research, the 10 year return of the average U.S. equity fund for the period ending 12/31/13 was 8.18%. What was the average return of U.S equity fund investors over this same time period? Unfortunately, only 6.52% (click here for the full report and see the below chart). If you believe that this 10 year period was an outlier, you can look at research from the institutional investment consultant DALBAR. The findings showed that investors have underpeformed the market by approximately 4.2% per year over the past 20 years (click the following, “Bad Decisions Persist After Decades of Education and Disclosures” to read the full whitepaper). If you do not already have a written Investment Policy Statement (IPS) or long-term plan, consider getting one. At Fiduciary Wealth Partners (FWP), we work with clients to help set long-term investment goals, and establish risk, liquidity and asset allocation targets designed to meet these objectives before we invest. It has been our experience that, if you write down goals before investing, it is easier to stick to a plan versus letting emotion, or the competition of the market, take over. FWP believes that an IPS should set long-term targets for various asset classes and maximum and minimum risk control ranges around the targets. This way, regardless of the emotion of the market, you can keep yourself from making big bets that can turn into big mistakes. As an example, a moderately risk-adverse investor might consider having a long-term target of 60% in equities with a low end range of 50% and a high end range of 70%. If the market drops significantly and the equity allocation goes below the minimum range, the IPS mandates that an investor buy. On the other hand, if the market has run up significantly, the maximum IPS ceiling forces selling to take some chips off the table. We recommend reviewing allocations and rebalancing back to long-term targets quarterly. Beyond the Morningstar or DALBAR research mentioned above, one of the best examples of potentially lost opportunities might be from the 2008-2009 financial crisis. In March 2009 the S&P 500 hit the “world is going to end” level of 666. If you had an IPS in place, and someone to help you stick to your written plan (it is hard to keep emotions in check on your own), you would have found yourself below your minimum allocation target to equities and would then have bought equities at the end of the quarter to rebalance back to your long-term target. Even after what the financial press is currently calling “a rout”, the S&P 500 closed yesterday at 1,970. A gain of over 195% over from the 666 low in 2009. To help “keep calm and carry on”, below are a few simple recommendations to consider. – Always ask for complete transparency on all fees, risks and conflicts. – As with many things, the tortoise consistently beats the hare and often with much more peace of mind and less heartburn, which makes it easier to stick to a long-term plan. As my son has learned on the water this year, conditions are often out of our control and can change rapidly. Be prepared and stay broadly diversified. Don’t reach for returns. Keep focused on your long-term plan and don’t be sold the hot investment strategy. Staying with the boating theme, and an old tried and true saying, make sure your “ventures are not in one bottom trusted” (Merchant of Venice – Shakespeare). This past week brought market storms, but remember, history consistently teaches us that true long-term investors (who will in practice come in for the most criticism – John Maynard Keynes) will continue to be rewarded for keeping a steady hand on the tiller. Nobel Prize winning physiologist Ivan Pavlov is best remembered for his work on what psychologists call “classical conditioning”. Classical conditioning refers to a learning process connecting a specific stimulus to a specific response. While any number of responses to stimuli are innate (jumping in response to a loud noise, for example), Pavlov demonstrated that responses can also be learned, or conditioned. Pavlov’s discoveries about classical conditioning centered on his experiments with dogs. During his work exploring the canine digestive system, Pavlov learned that dogs salivate when presented with food, a reflex that aids their digestion. Observing the animals in his lab, he noticed that the dogs also drooled when they saw a worker in a white lab coat. Ultimately, he realized that, because the dogs were fed by workers in white lab coats, they had come to associate white lab coats with food and they salivated in response. Interested to see whether he could induce the same reflex with another stimulus, Pavlov began ringing a bell before presenting dogs with food. Within a relatively short period of time, the dogs associated the ringing of the bell with the stimulus of food and began to salivate at the mere sound of the bell, even when Pavlov did not present the food. In this fashion, Pavlov produced a learned – or conditioned – connection between an environmental event previously unconnected to a reflex (the bell) and a reflex (salivation). Pavlov’s work was instrumental to our early understanding of learning. Conditioning drives a great deal of behavior, a fact well known both on Madison Avenue and Wall Street. Commercial advertising, for example, is designed to train the recipient to connect positive feelings with a product. Think of a massive Clydesdale and an adventurous little Golden Retriever puppy striking up an unlikely friendship and what product pops into your head along with a warm “Awww, cute” feeling? Budwiser: The King of Beers. Classical conditioning at its finest. On Wall Street, classical conditioning is evident in its advertising for sure, but equally in the conditioning of trader and broker behavior. Commission-based compensation systems are the foundation: a simple reward system in which you sell and you make money. There’s nothing inherently wrong with these systems. It is important to understand what overlays them, though: the intentional fostering of a competitive, emotional environment for sales. A bell rings at the opening of the New York Stock Exchange and the competitive frenzy begins. “Ringing the bell” is a euphemism for making a sale because some brokerage firms literally used to ring a brass bell every time they made a sale, enhancing the already powerful impact of earning sales commissions with powerful emotional feedback from public approbation and victory over one’s peers. The fostering of these strong emotional responses to sales can be so intense in the financial services world that they can even overtake the importance of commissions. I’ve known brokers who have made so much money that even they acknowledge they don’t need more – but they stay in the game because they are addicted to the sound of the bell or the sight of their names at the top of a league table. The stimulus that made me start writing this post was a recent report by the Ontario Securities Commission (“OSC”) about the adverse effects of commission-based broker compensation systems on mutual fund investment performance. Acting on behalf of the Canadian Securities Administrators, the OSC commissioned The Brondesbury Group (“TBG”) to review existing research on mutual fund compensation. While I won’t go into it in detail here, addicted as I am to good data, TBG’s research is impressive. Their disclosures are comprehensive (they discuss their own potential biases), they offer both sides of the argument, and they back up their findings with solid academic research. Funds that pay commissions to brokers underperform compared to funds that do not have these expenses. Funds sold in the broker channel (defined as commission-based) underperform direct channel funds (no commission) even before deducting any distribution-related expenses. Research studies repeatedly find that commissions (load, 12b-1, etc.) and expenses are key drivers of relative fund performance. Quite simply, any payment that raises costs tends to lower return on investment. Funds paying more to brokers realize lower returns than comparable funds that pay less. It is incontrovertible that compensation affects fund flows. The literature on compensation and fund flow provides sufficient evidence to conclude that embedded commissions influence broker advice and, at times, that advice serves the interest of the broker and the product provider rather than the client. At the bottom of this post I have listed links to some of the research that TBG used in reaching their conclusions. Many of the titles tell stories unto themselves. The existence of commission-based systems alone could be the source of the TBG findings, but I think conditioning in the industry is at least as much if not more of the issue. There’s nothing inherently wrong with the idea of products sold on commission, just as there’s nothing inherently wrong with the idea of commission-based compensation systems. As BTG’s research shows, however, these products and systems aren’t necessarily producing the best outcomes for investors and the intensity of the competitive environment in which they are being sold surely plays a role. So when you hear the next exciting investment pitch, remember that the things that your broker is excited about may have a lot more to do with Pavlov, and the ringing of the commission bell, than with your portfolio returns or peace of mind. Is Bad For Business Sometimes Good? Change and innovation is often resisted, and disruption can be harmful to the status quo. Did whip and horseshoe makers fight against the adoption of early cars by highlighting them as being dangerous? How many print media papers talked down on-line media and initially resist change? Today, FitchRatings, the big credit rating firm, issued a press release warning about the harm that might come to pending changes in how investment products are developed, marketed and sold. They highlighted how the Department of Labor’s (DOL) pending Fiduciary Rules might negatively impact asset management firms. The full press release from Fitch can be found by clicking on the link listed below. Fitch is doing what they should do, raise a red flag on behalf of those who invest in asset management companies. The DOL’s proposal might impact profit margins and diminish the case for investing in asset managers. Many traditional asset management firms are resisting change that will come if they are held to a true fiduciary standard. This is understandable. Current business models will be harmed and time and money on innovation will be required. Would changes that might harm status quo asset managers be a benefit for investors? Is the Fitch report yet another example of why more transparency and change needs to come to how investments are developed and sold?